The accelerometer mouse is a module, part of the blessTags application, which can replace the mouse with a SensorTag device. The SensorTag is able to move the cursor on the screen and to replace the two mouse buttons with the buttons of the SensorTag. Keeping the SensorTag in the horizontal position will generate no movement of the cursor on the screen. Pitching the SensorTag down-forward will result in a movement of the cursor to the top of the screen. For the same SensorTag movement, but in the opposite direction (down-backward), it will cause the cursor to move to the bottom part of the screen. Rolling the SensorTag to the right or to the left will generate a movement of the cursor, on the screen, to the right or to the left - the speed of the movement is in the correlation with the rolling angle. The following movie shows the basic moves that can be done with this device. The application also allows configuration of each device (CC2541DK, CC2650STK, Thunderboard React and Thunderboard Sense) according to user's wishes. 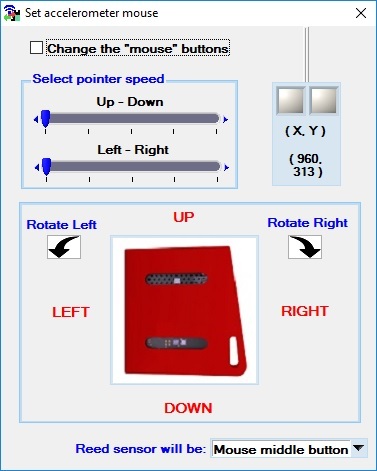 Set the 3rd button function (only for CC2541DK and CC2560STK): mouse middle button or mouse X button. Mainly, because the SensorTag interferes with the mouse (it was designed to do that), to have only a mouse control just place the SensorTag in a horizontal position or close the accelerometer mouse application. To illustrate how the accelerometer mouse works, in the following, I will present a movie in which slither.io's mouse control has been completely replaced by a SensorTag. Attention: for CC2650STK the keys must be pressed less than 3-6 seconds! If you press the buttons longer, always you will get the following effects: (a) for the Power button more than 3 seconds: disconnect device and (b) both buttons more than 6 seconds: restore factory settings, i.e. apply the flash image that was programmed at production. In slither.io game in order to have a speed bust, the left mouse button must be hold down. This action will cause only for the CC2650STK to disconnect the device. From this reason, in the above movie, I exchanged the functions of the SensorTag buttons. 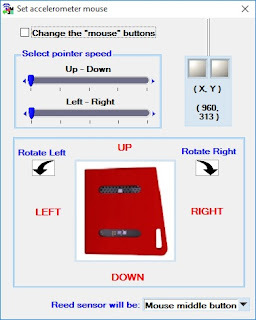 As a result, the power button was associated with right mouse button.